Sometimes we do things a little differently around here. 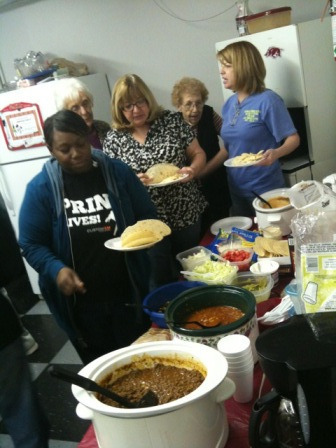 So instead of a traditional company turkey-laden potluck before we take a couple of days off to repeat this process, we decided to go Mexican, buffet-style. We call it our Annual Mexican Thanksgiving Feast. If you are not thankful for tacos, cheese dip, taco soup, homemade salsa and four layer delight dessert, then you are truly un-American. And I would have to second Lisa’s comment regarding Sandy’s return! What about me? It’s hard to add to what was said above, but I would say that I am thankful for the Opportunity. The opportunity to work, the opportunity to succeed, the opportunity to love and care, and the opportunity to make a difference. I hope I continue to make the most of all these opportunities. So, we’re thankful for many of the same things that you probably are. It’s nice to take the time to reflect on all the blessings we continually receive. And it’s nice to enjoy this time, while eating a taco! Hi everyone — it’s Amy here. I’ve been doing some research lately on how to market with holiday gifts. I’ve been looking for ideas that are original, cost effective and memorable. Quite a few of the things I’ve found include a print element, so I thought I’d share some with you here. One cute idea is to have holiday-specific business cards. Go all out and have a business card that almost looks like a mini greeting card on the front, but that has your standard contact information on the back. I saw one for a personal trainer that had the phrase “Merry Fitness!” across the front. It was clever, funny and a great reminder that you’d need his services after the holidays! When it comes to business cards, any deviation from the norm catches people’s attention. And a holiday memory will lift people’s spirits all year long. I love the idea of giving handmade gifts. 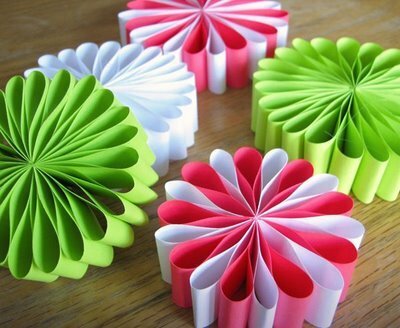 Origami ornaments are easy to craft and make lovely keepsakes. How about printing special holiday wishes on your paper? Your ornament will be a work of art, and the printed words will add an extra dimension of care. I also read about a lawyer who had posters made with his likeness on them, with a bulls eye over his photo. He sent them to his adversaries, with a couple of darts packed in the poster tube. I can’t hep but think he must have garnered a little good will from people who once disliked him! 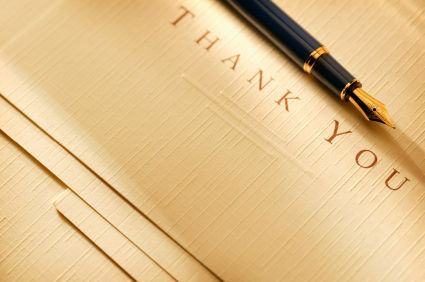 Take the time at the end of each year to say “thank you” to the clients or friends who have made a difference. Order some high-quality letterhead and jot down a hand-written note. It’s a small but memorable gesture. And regardless of the season, it’s always a good idea to have custom labels on hand. Whether you’re giving someone a tin of baked goods, a bottle of wine or a gift basket, it’s nice to be able to put your personal touch on a store-bought item. What kind of printed materials do you like to use or give during the holidays? Do you send lots of Christmas cards? Or do you prefer giving paper as a gift? Let us know! I recently moved into another office. After 20 years, I figured I was entitled to a change of scenery. As with any move, I was amazed at the junk I’ve accumulated over the years. Fortunately, I also stumbled across some treasures as well. One of these was an envelope that contained samples from a job we produced in 1980 for the Junior League of North Little Rock. 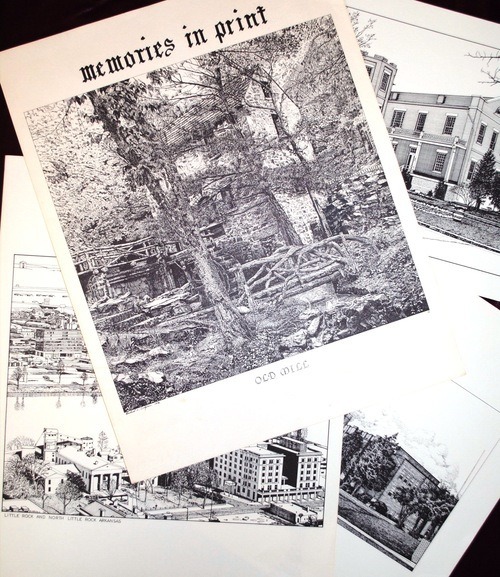 Entitled “Memories in Print,” this project contained a collection of prints by Richard DeSpain, a renowned local artist who has received national acclaim for his pen and ink renderings of local landmarks. Flipping through the samples, it dawned on me how appropriately titled this collection was. Page by page, each print invoked memories of days gone by. 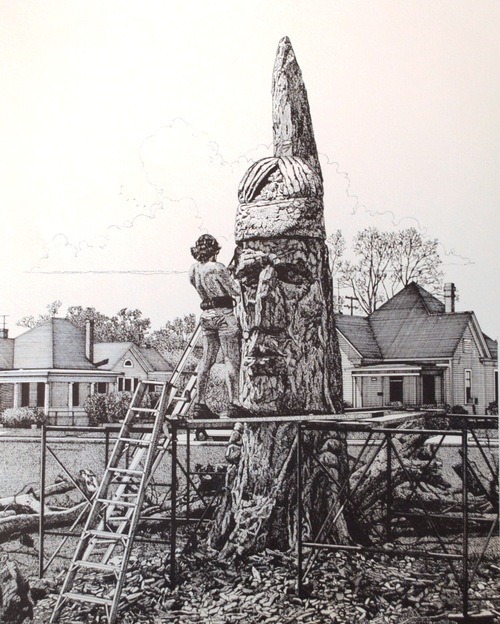 “The Indian at the Arkansas Arts Center.” This was my favorite as it reminded me of the Sundays I witnessed an old dead tree come to life at the hands, and chainsaw of the Hungarian emigrate, Peter Toth. You see, my paternal grandparents lived on Commerce Street, directly across the street from the Arts Center. We would visit Momma & Papa Strack every Sunday afternoon. This project began in 1975, and was part of Toth’s goal to sculpt a giant Indian face in every state as a permanent reminder to Americans of their inhumanity to the native Americans. Park, this building held many memories as well. An old arsenal building, which was once the home of army officers and their wives, was the birthplace of General Douglas MacArthur. During my younger days, (actually, in 1964), the building had become the Museum of Science and Natural History. My favorite exhibit during those days was the “rock room”. A darkened room showing encased native stones where you could press different buttons that would illuminate different colors of light. For some reason, we always had a dreaded fear of being locked in this room, and in this old building. In 1983, the Museum’s name was changed to the Arkansas Museum of Science and History. In 1997, the museum moved to a new location in the River Market, where it is now known as the Museum of Discovery. 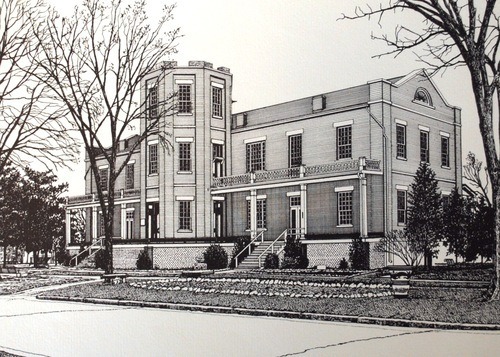 Today, this building now stands as the MacArthur Museum of Arkansas Military History. 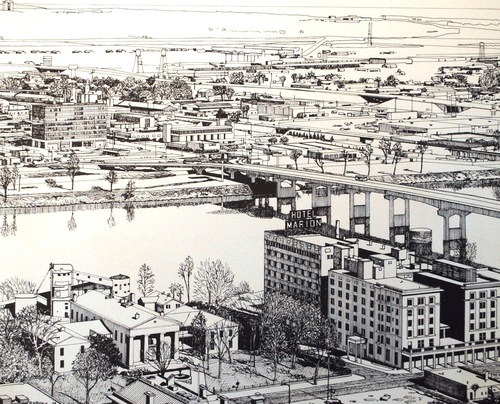 “The Twin Cities.” This 1979 drawing by DeSpain shows how far the Twin Cities have evolved, and improved in 31 years. I recall the implosion of the Hotel Marion in 1980, to make way for the Excelsior Hotel (now the Peabody). Notice too how the North Little Rock skyline has changed. Although the population of the twin cities has not changed drastically, the amenities certainly have. During this past year, I have often preached that one of the many values of the printed piece is its longevity, and its ability to tell a story. This collection of Memories in Print certainly accomplishes both. So tell me, what memories do these prints evoke? What stories of your bygone days to they tell? Please share, won’t you? Hey everyone — Amy here. I’m blogging the Integrating Media conference. Think of this blog post as glorified note taking. I’m trying to type as fast as I can and jot down the key points, and I’m going to hit “publish” soon after the conference is over. Change is inevitable! If it weren’t, Paul would still be wearing leisure suits! And for that alone, we need to embrace change! Today’s conference is all about how we can change the way we market. And one new marketing tool we have at our disposal is QR codes. Our audience today is semi-savvy about QR codes. We were polled before we arrived, and only a very few of us are actively using QR codes to market. A few more of us are aware of QRs and are using apps to decode them. But a large group of us have never even heard of them. Here are some interesting statistics: Mobile device use will outstrip desktop computer use by 2013. And text messages have an incredible open rate — 90%! Wow. That beats any email campaign open rate I’ve heard of. All this mobile phone use makes phone-based marketing more important than ever. QR codes were created in 1994 in Japan by a company that’s a subsidiary of Toyota. They were initially used to track auto parts. They are a part of every day existence for the Japanese. QR codes, mobile marketing — these are not marketing strategies. They’re simply marketing tools. But they’re relevant, fast, clean, engaging and convenient. Now Jamie Walden from the Laman Library is up. He’s already actively using QR codes to market and to reach out to library users. His main goal when he started was to make the library more accessible through technology — website, social media, etc. Right after he started, they greatly improved the library website, and they wanted to drive traffic to the new site. Their choice to use mobile marketing was driven by those statistics that said more people would be accessing their site on mobile devices, not PCs. Jamie says QR codes are NOT the Holy Grail of marketing. They are just a very effective vehicle. They’re more impressive than giving people an URL. They’re like sending a limo to pick a client up at the airport, rather than an old taxi. Also, they help his library look relevant and cool. He uses QR codes on direct mail and in print ads. The codes help give people way more info than what can go in a print ad — videos, music, etc. And he likes that they go to a very specific destination. That helps filter out the noise, cuts down on clicks and searching. Fewer steps = a better user experience. Laman has had 400 scans from ads, etc., and 500 scans of the QR codes on their business cards. But he thinks media needs to talk about QR codes more. Extra note — you can’t sell someone in a quarter page ad. But you can send them to a web page that will sell them. Now Dena Woerner, the Communications Manager for the Arkansas Department of Parks & Tourism is up. She’s progressive — she made Arkansas the first state tourism agency in the country to use QR codes! They’ve used QR codes to send people to specific landing pages, help create trip itineraries, and will soon use them in a campaign that features 15 second videos. How cool — a print ad that gives viewers an interactive experience! P&T first used QR codes in an Oxford American magazine ad. They were going to make them a clever design, but decided that since they were new, they needed to be obvious and straightforward. They then had to educate people about them — they sent out lots of press releases about QR codes, not necessarily tourism. They use QR codes for media pitches, too. Dena was able to send a journalist a code to the exact info he was looking for, and she really got his attention, because what she did was novel. They’ve gotten much exposure just for their use of codes. They’ve gotten mentions and coverage around the world without having to buy an ad. She also likes that QR codes give analytics that go beyond basic tracking. She can follow the trail of a visitor to the site. She only tests her QR codes with free apps, because she doesn’t want anyone to have to pay to get her information. And she only creates codes with free programs. Extra note — Arkansas is quite progressive using QR codes. Lots of entities in this state are using them, and lots of Arkansans are therefore aware of them. Paul’s back up, and he’s mentioning how CustomXM employees use codes on their business cards — the QR code automatically loads his contact info on your phone. He too loves the tracking. They can know exactly how many codes in a campaign were scanned. Plus they get demographic info from scans, like what age group scanned codes in a print campaign. Codes don’t have to just direct back to websites. They can be used to send an email, make a phone call, give a map/directions, even send people to your latest tweets. So what does it take to use and make QR codes? You must have a smartphone. You must have a reader app. SOme apps are BeeTagg, i-nigma, Kaywa, QuickMark, ScanLife, QR App, Optiscan ($1.99, but worth it — great scanning ability, allows you to generate codes from your phone). Some phones are now coming with pre-loaded readers. How do you create a QR code? There are some good generators out there, but why not use CustomXM’s? www.customxm.com/qrgenerator They have all kinds of options — send to website, email, phone, latest tweet, etc. The code is generated, then you just save the file as an image and use it however you like! 1) Make content valuable. Don’t just send people to a repeat of the ad. 2) Keep URL short. The longer it is, the harder it is for readers to scan. Use an URL shortener like bit.ly. 3) Mobilize your landing pages. Make your website mobile-friendly. Don’t send someone who’s by default using a mobile phone to a page that isn’t phone-friendly. 4) Don’t link to something that has no value. 6) In your ad featuring a QR code, don’t forget to direct people to an app! Don’t forget to educate people on what a QR code is. 7) Don’t forget to add white space around a code. 8) Don’t go too small. No less than inch x inch. 10) Don’t place a code anywhere with no phone service. Act now! This is coming! Be one of the first, not one of the last, to use this new technology! Are there design limitations? Most important is contrast. You can do some overlays and colors, but don’t go too crazy. Can it be added to an existing ad? What’s the cost? Reworking an existing design is usually not a huge cost. Tracking services are charged by time frame and by the number of codes. To Jamie and Dena — any objections form higher-ups about using QR codes? None for Jamie. The costs were minimal and the results were outstanding, so everyone was on board. Some for Dena. She had to give a big presentation for campaign approval. They didn’t want to ruin the beauty of their print ads. Plus the whole piece about having to educate people was a concern. Some were concerned about how many people have smart phones. But those numbers are rising rapidly. Can you put them in a yellow page ad? Sure. It might be cool to link that code directly to a phone number. Paul has seen a story on the web about how (in Japan) QR codes are being put on tombstones. Seriously. They go to a web page that shows a video of the person’s life. Mike Mueller shared that when you claim your business’ page on Google, it generates a QR code for you that will direct people to your Google listing. Katie McManners has a great idea for singles — create two QR codes, one with your real phone number, one with a fake. When you’re out at a bar, give the code with the real number to the people you’re interested in (the hotties), and the fake number code to those you aren’t interested in (the notties). If you were here, don’t forget to fill out the online survey. There’s a QR code that links to it in your folder! Thanks for coming, everyone! And if you want more info on QR codes, contact us! We run a lean operation. People are often surprised to learn that we employ only 12 full-time team members. We try not to over-hire, and when we lose a staff member, we don’t immediately replace that position. I do realize that this can be counter-intuitive if our goal is to grow the economy. But let’s be honest, that’s not our goal. Our primary corporate goal is to make a profit. If we are profitable, all other goals, including growing the economy, will eventually be met. But in order to profitably grow our business, we occasionally have to take on tasks for which we are understaffed. Or under-talented. Don’t get me wrong, I never accept work that is not a good fit for our core competencies. To do so would be a disservice not only to our clients, but to us as well. But as we adapt to this “new economy,” we have to adapt our offerings as well. Sometimes, we realize that we can do more, and do it quite well, with the assistance of the right people. It’s no secret that an effective leader surrounds himself with individuals that are smarter than him. No secret to me, anyway. Sure, the quick retort is to say, “Paul, aren’t most people smarter than you, anyway?” Well, yes, but I believe that my one of my greatest strengths is seeking and utilizing this wealth of talent, both internal and external. Twitter has greatly accelerated my access to this talent. Over the past 18 months, I have befriended a variety of individuals who continue to contribute to our success. And I do sincerely consider them friends. Having met them via Twitter, they were avatars, then individuals, and finally friends….before I ever considered them as talented assets. And so outsource opportunities continue to make us a larger entity than we are…but that’s okay. We are considerably stronger because of it. First, an infrequent tweep and longtime (pre-Twitter) friend is Steve Davison (@sdavison52). For many years, he has assisted me in my sales and marketing efforts. If you open a sales opportunity for him, I have no doubt he will close the sale. He is that good. But all work and no play makes one hungry. And for that need, I have outsourced my sweet-tooth desires to Kelli Marks (@kellimarks), cake-baker extraordinaire. My point is this: No one person — or even a good team — can do everything. Sometimes it really does take a village. I’m thankful to have found a great networking platform (Twitter) that has helped me meet some really talented, cool people. Don’t be afraid to reach out and ask others for help. It’s what successful people do. https://www.customxm.com/wp-content/uploads/2013/05/custom-xm-logo-300x100.png 0 0 Paul Strack https://www.customxm.com/wp-content/uploads/2013/05/custom-xm-logo-300x100.png Paul Strack2010-11-03 21:33:072010-11-03 21:33:07Outsourced!